PARIS — A standard-issue hybrid might be the weapon of choice for stop-and-go commuting in the United States, but clean diesel is coming soon. And it’s hard to beat diesel’s efficiency for longer, high-speed hauls—especially in Europe, where some of the limits are well north of even our speediest 75-mph interstates. 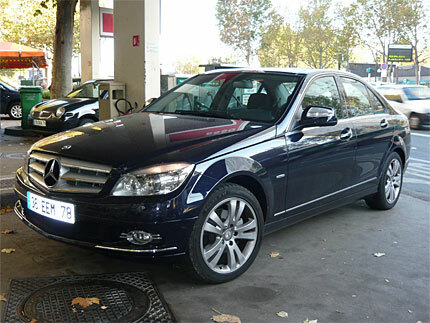 So we decided to see what a modern clean diesel could do on its home turf, landing here in France and grabbing the keys to a Euro-spec 2008 Mercedes-Benz C220 CDI. The C220 CDI model, which is not yet available in the U.S., uses a turbocharger and a common-rail, high-pressure fuel injection system to produce a compression ratio of 17.5:1. Its 2.2-liter inline Four pumps out 170 hp, but that lackluster number is countered with an impressive torque figure: 295 lb.-ft., which peaks at a mere 2000 rpm. That’s more torque than the top (non-AMG) 3.5-liter V6 we get in the Mercedes-Benz C-Class here. During startup, the Benz gives you a touch of that “knock-knock” diesel noise if you’re standing outside the car. But slide inside, and all is quiet. Europeans don’t have to deal with annoying legalese agreements on their nav systems like we do. The systems just work the moment you twist the key. And unlike the sometimes dubious traffic updates we get in the States, the system on our Benz could fairly accurately foresee major highway delays. Torque picks up almost immediately from idle. And our CDI’s smooth-shifting six-speed manual didn’t spend long in each gear, since the engine is happiest at lower rpm. After 10 days of city and highway driving, we got an appreciation for why the C-Class is Mercedes-Benz’s top-selling model. The nav system worked seamlessly in Paris’s complex network of bridges, back streets and turnarounds. Hill Start Assist made stop-and-go driving on hilly areas like Montmartre a breeze. And unlike some manual transmission cars, we never wished for an extra leg for the brake pedal. Once we hit the smoothly paved autoroutes for the south of France, the C220’s autobahn-bred road manners revealed themselves—so much, in fact, that we were nabbed by BMW motorcycle-riding gendarmes and slapped with a 90-euro fine, which we paid on the spot in cash. This experience certainly discouraged us from further testing the limits of the car. But the stability of this Benz at triple-digit speeds made temptation tough to resist. The car was at such ease covering long distances that it inspired an impromptu cannonball to Barcelona, Spain, for a quick hit of tapas and Gaudi. Yes, the food was worth every mile—and every liter of fuel burned.